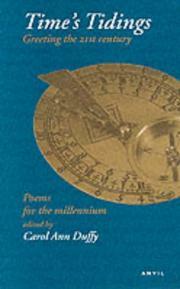 Oddly surprised and invigorated by the discovery that “no anthology had focused on the theme of time in poetry,” Duffy has attempted to shore up the gap, gathering a collection of poems by 50 contemporary poets (English, Irish and Scottish), in which each was invited to submit his own favorite poem on the topic. This gives us 100 poems altogether, a reassuringly round number for what is, in fact, a very uneven collection. Such a result might have been predicted by the editor. The size of the abstraction is obviously too large: “Ever the Everest among concepts,” was how Merrill measured it in his poem “Time.” Here, the selected poems are so eclectic in their treatment of the theme that the juxtapositions, instead of stimulating, merely bewilder. Elegies and laments predominate, but they are made to cohabit with the eerie enthusiasms of Lawrence’s “New Year’s Night” and the low wit of John Agard’s “How Laughter Made the Clock Smile.” In her introduction Duffy seems resigned to the thought that her hodge-podge will not bear the stamp of any presiding intelligence, but believes this flaw more than compensated for by “the curiously catalytic process by which a poet’s choice would often reveal something new or concealed about their own work.” This is an interesting strategy if the editor can rely on the reader’s familiarity with each of the poet’s œuvre, but since most of these poets are not widely read—especially not on these shores—the gambit founders. For example, the relationship between Henry Graham’s “Mal” and his chosen poem (Rimbaud’s “Barbare”) is foggy at best. What Rimbaud’s poem has to do with Time is cloudier still. There are the occasional minor successes. To read Yeats’ hermetic quatrain “There” after the dizzying colloquialisms of Muldoon’s “As” gives the former poem a new jauntiness and unsuspected lilt. More often, however, the pairings are only obfuscatory and puzzling; the collection’s scattered points of interest cannot redeem its wider failures.